New Landscaping Coming to Western! Since we no longer own our demonstration garden on Alessandro Blvd., we are using the funds from the sale of the garden to create a beautiful, sustainable landscape around our headquarters building at 14205 Meridian Parkway, Riverside. From late April through the summer the new irrigation and landscaping will be installed. Created especially for the Riverside area. Sort through features and filters and lots of photos to find appropriate plants for your needs. A program to help you find climate-appropriate plants. Conserve resources and beautify your landscape with this University of California Cooperative Extension publication. 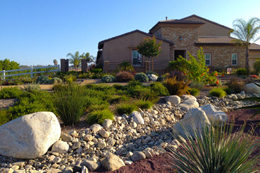 Do you have an established water-efficient garden? Show the region that saving water can be beautiful! The contest accepts entries April through May of each year. Check out the contest web site for great ideas and inspiration. Get ideas from these climate-appropriate landscape design templates. More coming soon! The following plans illustrate landscape designs that are created for two types of residential customers: "family" and "empty nesters." Each of these customer types contains plans for three types of watering regimes: very low water use (30% ET), low water use (50% ET), and moderate water use (70% ET). Participants in our recent turf replacement program spend, on average, $2.50 per square foot for a basic landscape of plants, mulch, and drip irrigation conversion installed by a contractor. However, when hardscape items such as pavers, patios, pergolas, and walls are added, the costs can increase greatly and will vary with the type of materials selected.